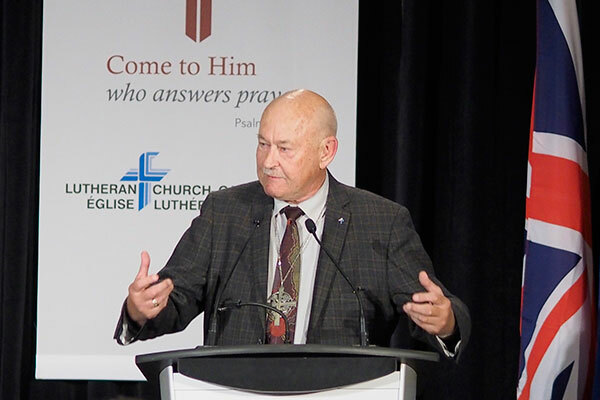 VANCOUVER – In the midst of convention work Sunday, attendees heard greetings from Lutheran Church–Canada’s first two presidents: Rev. Dr. Edwin Lehman and Rev. Dr. Ralph Mayan. Dr. Lehman is still recovering from surgery earlier this year and was unable to attend in person. He therefore sent his well-wishes in the form of a letter, which Third Vice President Rudy Pastucha read aloud to the convention. His letter goes on to assure delegates that will he keep them in his prayers. Dr. Lehman served as LCC’s President from its founding convention until 1996. Dr. Mayan served as President of Lutheran Church–Canada from 1996 to 2008. President Bugbee thanked Dr. Mayan for his words, and encouraged LCC members and congregations to hold him in prayer. Dr. Mayan has just been diagnosed with bone marrow cancer.